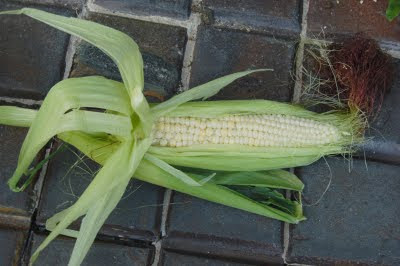 The first sweet corn. Well, not quite the first, we had a couple of baby cobs in our tempura the other night but this is the first to be eaten from the cob and it was delicious. The variety was Double Standard from Realseeds and although the plants had a poor start I think we're going to have a few good meals from them. I also made a later planting of Golden Bantam which are growing strongly but the weather needs to stay good so that they will actually seed. Like garden bloggers all over the northern hemisphere I'm going to moan and wail about late blight. In fact we've been tremendously lucky, the cold winter, dry weather and a certain amount of spraying with bouillie bordelaise, the infamous Bordeaux mixture of copper and lime which is barely permissible in organic gardening has kept symptoms at bay until now. 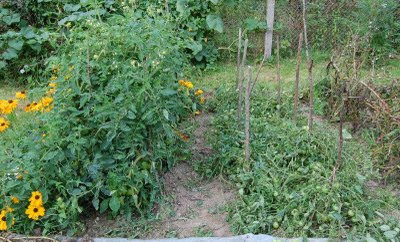 The potato plants are all but finished anyway so on those I'll simply remove the foliage and harvest over the next few weeks. The tomatoes are still growing though, in fact, they'd started to make new growth in the last couple of weeks and were sporting a lot of flowers. All that has had to come off, they would probably not have ripened the fruit before the end of the summer anyway, and I've given them one last spray. Some of the varieties have yet to ripen a single fruit and I do so want to know how they taste. The Latah is in full harvest now, so it's not a matter of tomato write off as in other years but it's still going to be a close run thing for the Purple Ukraine, Salt Spring Sunrise and the Scotland Yellow. 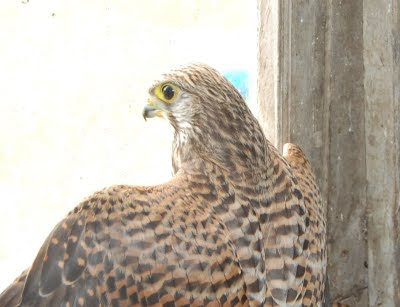 This silly bird, a European Kestrel, followed a swallow home and got trapped inside the swallow room. We've had several young kestrels practising their hunting over the farm in the last week but I didn't think they would be so silly as to go into a building. They are extremely beautiful and to be so close to a wild raptor was wonderful. I'm still amazed at a Kestrel flying in through that opening - so much narrower than even its relatively modest wingspan.